February features one of our favorite events of the year – the annual Indo-German Chamber of Commerce soccer tournament. This year marks the 11th annual IGCC soccer tournament, an event which is always one of the highlights of our spring semester. The tournament is a fundraiser for Shanti Bhavan, and all proceeds from the day go towards supporting our program. Our junior and senior teams began training for the tournament in early January, coached by our own Director of Operations, Ajit George. Their hard work paid off – our junior team earned 3rd place, showing great teamwork, perseverance and sportsmanship. Our senior team battled valiantly throughout the day, winning three games and narrowly losing the championship match in a dramatic penalty kick shootout. They took home the 2nd place trophy, and the team is already eager to begin preparing for next year’s tournament. Shanti Bhavan cheerleaders kept the crowds excited throughout the day, finishing with a show stopping performance at the end of the evening. 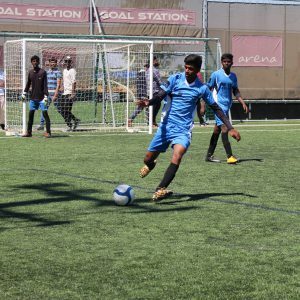 A number of Shanti Bhavan graduates and supporters joined us at the venue, and it was a day of sunshine, good food, great soccer, and fun. As always, we are grateful to the commitment from our supporters. It was a wonderful day for all involved, and we thank the Indo-German Chamber of Commerce for their generous support!